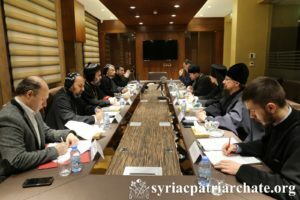 The Second session of the Commission for Bilateral Dialogue between the Russian Orthodox Church and the Syriac Orthodox Church took place in the Syriac Orthodox Patriarchal Residence in Atchaneh – Lebanon, on February 18–19, 2019, hosted by the Syriac Orthodox Church. It was chaired jointly by His Grace Bishop Flavian of Cherepovets and Belozersk, and by His Eminence Archbishop Mor Chrysostomos Mikhael Chamoun, Patriarchal Vicar and Director of the Patriarchal Benevolent Institutions in Atchaneh. The Syriac Orthodox Church was represented besides His Eminence by: Very Rev. Raban Jack Yakoub, Director of the Patriarchal Youth Department, Very Rev. Raban Roger-Youssef Akhrass, Director of the Department of Syriac Studies, Deacon Imad Syryany, Staff member of the Patriarchal Secretariat, and Mr. Shadi Sarweh, Executive Director of St. Ephrem Patriarchal Development Committee. The Commission was informed about the actions taken on the various spheres covered by the dialogue, over the last year and a half, following the first session held in Cherepovets (December 8–9, 2017). Representatives also discussed new items of common interest. On the humanitarian level, the Commission highly appreciated the growing cooperation between the Russian Working Group and St. Ephrem Patriarchal Development Committee (EPDC), and discussed new common projects and additional collaboration. Academically, representatives discussed starting a student exchange program for Theological Studies. In addition, It was agreed on the further mutual participation in academic and theological conferences. The Russian Orthodox Church congratulated the Syriac Orthodox Church for the opening of its new university, namely Antioch Syrian University. On the youth level, collaboration between the direction of the Synodal Youth Department of the Russian Orthodox Church and the Syriac Patriarchal Youth Department is to be established, and youth from both Churches are expected to participate in youth activities organized by each department. The Commission also discussed the concrete perspectives of developing contacts between the two Churches’ monastic communities, and the possibility of organizing pilgrimage tours to the major Christian sites of both Churches. Representatives also studied possibilities of enforcing collaboration and exchange of the official positions of both Churches on certain public issues of common interest. Further cooperation in the cultural sphere was also discussed. Finally, the members of the Commission expressed gratitude to His Holiness Patriarch Mor Ignatius Aphrem II for the cordial hospitality extended.